This is so exciting! I finally get to show off the beautiful necklace that I created from my soup sent to me by my partner, Beckie Robison. First though, let me reintroduce you to my partner. 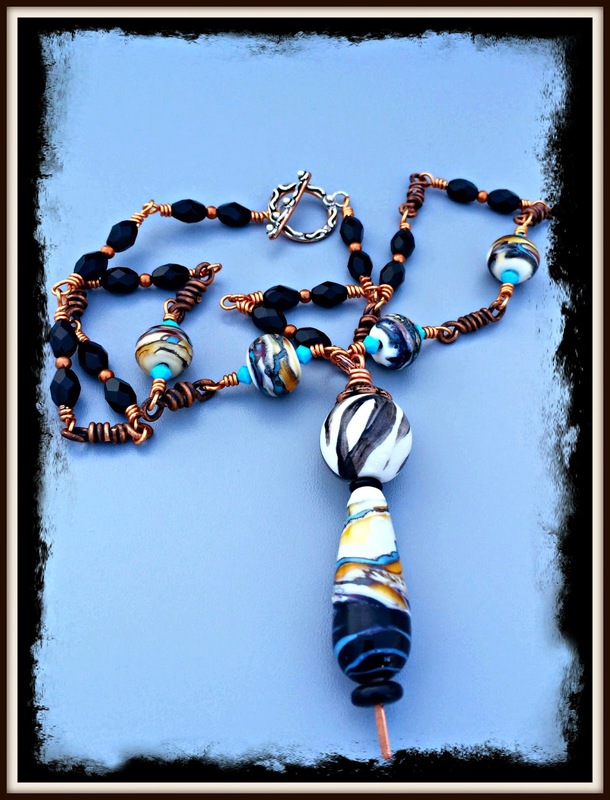 Beckie is a very busy lady who not only makes her own gorgeous lampwork and fused glass, but sells her jewelry both online at Spiral Fire Studio and through galleries. Let me show you some of my favorites pieces. Aren't they just gorgeous. Now here is the soup that Beckie sent to me. Not the best picture and I am sorry for that but just look at how she managed to nail my favorite colors and wardrobe. I will admit that I had issues, or challenges, with this soup. I know amazing considering how well it all flows together but that was my problem. I am used to breaking my soup up and making several different pieces with it. Every time I tried to do that with this soup, it threw a fit. The flavor was flat. I finally decided to listen to the beads and this was the result. Since I can't put together a soup without trying something new, I made my own links and aged them with Novica Patina. With the exception of the ceramic bead and the copper wire, everything came from my soup. And the lovely black and white ceramic bead is from Earth Butter Beads because the focal demanded it. Yeah, it going to sound strange but as I was working with these beads the focal kept demanding a voice. So I made sure she had a head so she would be able to speak. Now I did mention a contest. 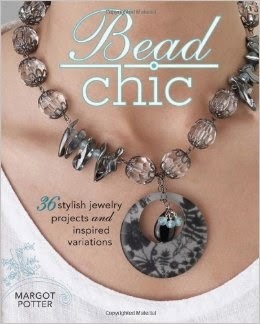 I recently picked up a signed copy of Margo Potter's Bead Chic. To sign up, please comment and fill out the form below. I am leaving it open for three weeks because there are a lot of folks participating in this blog hop and I want everyone to have a chance to make it around. Now this is a blog hop so make sure to check out the rest of the eye candy. There is apt to be some utterly breathtaking jewelry out there. Just click here to go to the list of participants. Now go forth and enjoy. What are you waiting for? Hi! 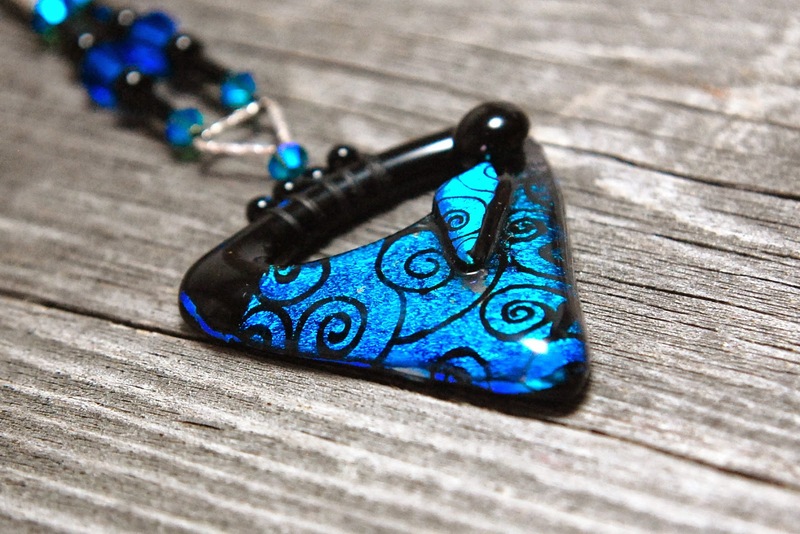 I was immediately struck by how alike our sent glass work was, black and blue swirls with touches of orange! It was so cool to see what you did with yours, The last necklace is beautiful and I would wear that piece frequently! Thanks for visiting my party post! 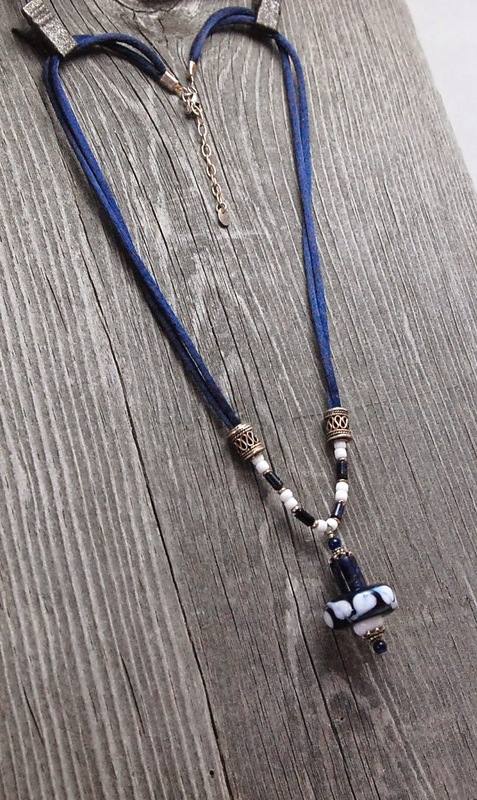 What a gorgeous fun necklace! Love the colors of the beads. It is good to listen to the be beads. The copper with the beads is gorgeous! Great color and nice flow to the necklace. what an amazing finished piece! I agree the pendant needed a voice!! You've done amazing!! You did a great job with a beautiful soup! Lovely pieces! Very pretty necklace! Love your wirework! You cooked up a beautiful necklace with your soup. Lovely. Your necklace is beautiful! Those beads did need to stay together. Very striking necklace with nice wirework. Your necklace is fabulous.... I love how you listen to the beads voice...I cannot agree more..
WOW! Gorgeous necklace! That is a fabulous bead for sure and you are right that Earth Butter Bead is a perfect complement! Isn't amazing how the beads speak to us. These beads spoke to you very well. Eye candy is the perfect term! Stunning completion. Oh - what a wonderful soup you got! Love the piece you created and glad you listened to the beads :) I think your necklace came out perfectly! I love what you came up with! Very inspiring! Beautiful beautiful piece, so rich and beautiful, great design! What a beautiful, beautiful necklace Shaiha (sometimes you just have to listen to the soup!)! very elegant necklace! good job! I'm so glad you listened to that demanding voice, it worked out perfectly! Way to go. This necklace is really gorgeous, you did well to listening to the beads:) The wire work the perfect complement for such lovely soup! Very nice piece!! Oddly, I've just discovered Earth Butter Beads as well...spent a small fortune on them at a show I went to a couple of weeks ago. Yours fits in beautifully. Gotta listen to the beads! Very pretty. I love the focal beads. sometimes it just works to pig out and have one big meal, so to speak. I think your necklace came out beautifully. I could see that with almost anything. It's sophisticated but would not look out of place with casual clothing. Just lovely! A bead listener...they know what they want! Beautiful job, love the wire work! Your necklace is just FABulous!!! I truly love the design. The colors and textures you've managed here are great as well! I love that you listened and gave her a 'voice' (head!). That's awesome! Shaiha your necklace is gorgeous. Yes, beads certainly have a mind of their own don't they? Thanx for showing me Beckie's lovely beads. It is very generous of you to giveaway what looks like a wonderful book. Thanx for a chance to win it. I would really like to add it to my stack of beading books. I think you're totally right -- you have to listen to the beads. Sometimes they whisper, sometimes they yell bloody murder until you do what they want! I think you did an amazing job incorporating everything. Also, I love Novican for copper so much better than Liver of Sulphur -- no nasty smell! Thank you for participating in this even through the years -- it means a lot. i am the sort of beader that tries to listen to the beads as much as possible. It doesn´t always work but when it does the results are great. What a fun soup! I really think you did right giving her a voice and in putting it all together in one necklace—beautifully done! The copper wire worked perfectly. It brought a harmony and beautiful flow. You had great beads and made a magnificent necklace! Lovely piece. Perfect for any outfit! 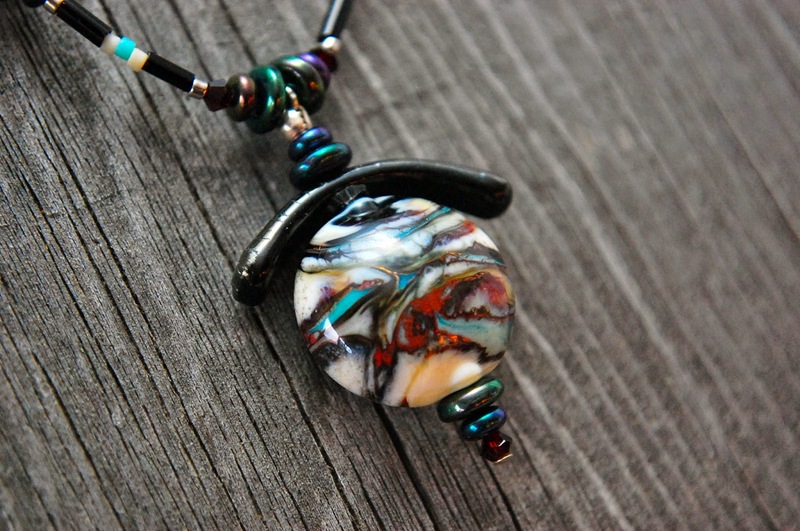 the lampwork focal is so exquisite. i'm glad you decided to pair it with copper and black. gorgeous execution! Hi Shaiha, thanks for visiting me. You certainly made good use of your soup your necklace is beautiful, I love the rich colour in the beads, works well with the wire too! Awesome beads and you really made them speak!! That's a beautiful piece!! Love the combination with the wirework. 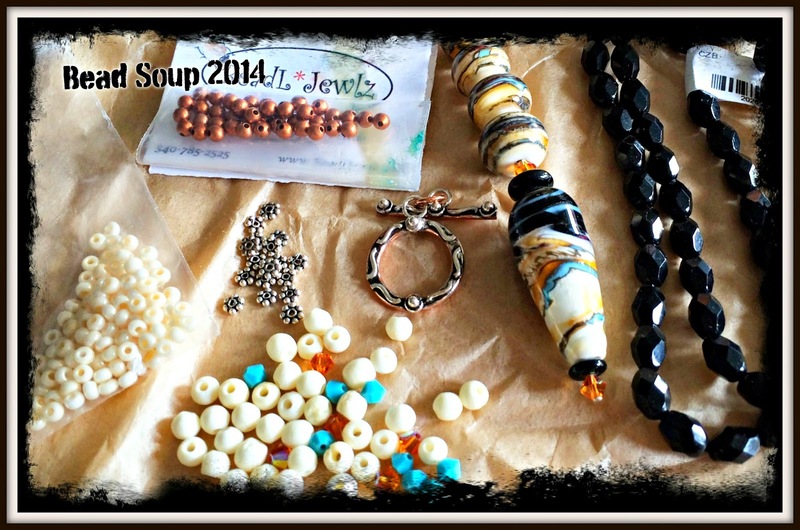 I love what you did with your awesome soup, the beads are gorgeous and you did them proud! Gorgeous colours in your necklace. The design compliments them so well. You did discovered the flavor Shaia! So totally not flat, I ♥love your designs & jewellery. What a beautiful creation from your soup! Sometimes the whole thing does just need to work together. Gorgeous materials! Love that you made your own links - that necklace is beautiful! I love the first necklace the most. I love how all the different shapes and color fit in to make it all work into a perfect little whole ! What a statement piece Shaiha. I love how bold it is. Great work. 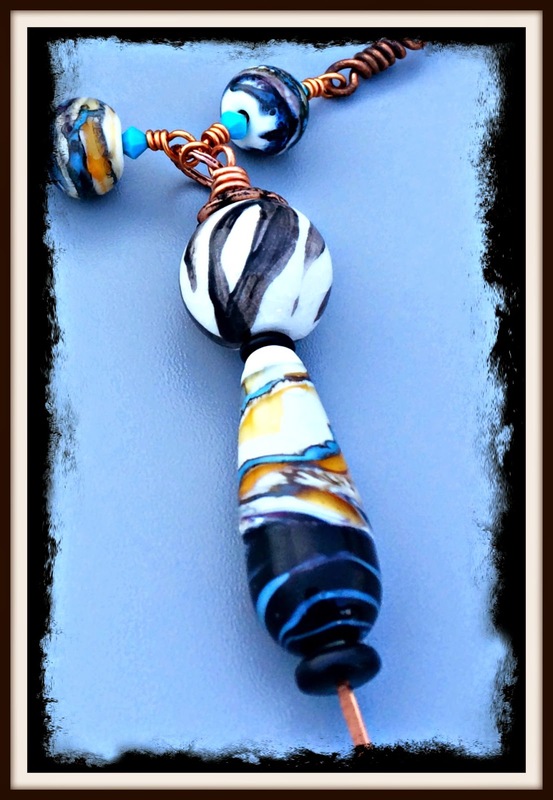 really love the way you jazzed up the lampwork pendant. so clean and classic. smart,smart lady. Beautiful way to "listen" to the beads. I love how you showed off that lamp work focal. I *totally* get the concept that you couldn't break up this soup - it *does* demand to stay together! I love the connectors you made - and the patina just rocks them totally. You put together a wonderful piece! Beautiful necklace design. It's good that you listened to your beads. Gorgeous necklace! Very cool designs! The colors and connections you made go well together and challenge was the word - right?? Great job! Lovely necklace, beautifully showcasing the focal. I think your soup was perfectly right in demanding to be made into one piece! And hasn't it worked beautifully with those beaded links interspersed with those gorgeous spring links. You were blessed with a gorgeous bead soup, and you made beautiful necklace with it. The colors & your design make me think of the desert & night sky together. Amazing soup equals an amazing design! Wow....it's Just Soup-er! Sounds like you got the rare but special "talking soup!" And you listened! It all works well together. Nice job! Fabulous necklace. Like a night sky at sunset. I like that you made your own copper links and patina-ed them. I'm inspired. Really Soup-er Job! Beautiful work. I really like the way you stacked the beads to make your focal. I also love the neutral colors of it. Great job. Shai, I have Margot's book (a wonderful one) but accidentally clicked there to comment (hopping for so many days is tiring... if only I were a bunny!) so ignore my entry, if possible? OK, the PARTY! The Beads! The jewelry! Beautiful necklace - great job listening to your beads! I am glad you listened to your beads. Beautiful creations out of a sumptuous soup. Sometimes you gotta listen to the beads! And in this case, I suspect they were right -- they do work so beautifully together! Good thing you listened to the beads... always listen to the beads! It is beautiful and totally fits you. Thanks for sharing! Most of the times you are in charge of the beads, but in this case the beads had their on story to tell. So glad that you were able to work it out for all of us to see. Great work! Lovely jewelry. Great idea to aged your links..
Wow just love these necklaces. what a great soup you had to work with! And I love the amazing necklace you made with it! Love the necklace. Perfect pops of color. I think you were right to use the whole soup in one piece. Good job. Beautiful work on the necklace. I love the use of copper with the soft tones of the beads, it really pops! Your ability to "listen" paid off greatly. What a gorgeous design! Love that you listened to the beads and your ideas flowed. Your use of copper wire as connectors really added to the beads as did the addition of the black and white bead to top the focal.